Hybrid diapers consists of a water proof cover and a biodegradable disposable insert. These inserts are made with wood pulp fibers and sodium polyacrylate. They are not like your traditional disposable diapers - they are free of plastic, chemicals, dyes and fragrances. The idea behind these inserts are for a more natural type of disposable better for our planet and your baby. Some of the inserts are also flushable. How Do You Use A Hybrid? The popular brands of hybrid diapers are G Diapers, Gro Baby with Bio Soaker pads, and Flip with disposable inserts. You can purchase the G Diapers in a package together with the inserts or "biodegradable diapers" or you can buy covers and inserts separately for any of the hybrid brands. Then you simply fit the insert into the cover and put onto your baby. Once the diaper is soiled you remove the insert and either dispose of it in the trash or rip open the top and pour the contents into the toilet.The G Diaper has a wand to use to swish the insert around to help it go down into the toilet. If you have a low flow toilet you will need to make sure these are broken up enough before flushing. You can also use any of these covers with cloth. All these brands make cloth inserts for their covers, or you can use a prefold or flat as an insert as well. Most of these covers also fit well over fitteds. Are These Really Better For the Environment? 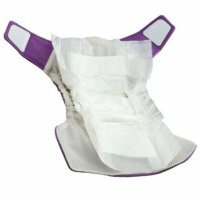 When I fist heard Cotton Babies, the makers of the BumGenius products, was coming out with a disposable insert for their Flip line, I was actually pretty upset. Cotton Babies is one of my most favorite companies and the thought of them making anything disposable made me feel like they were promoting something bad for the environment. After some research it turns out that the disposable inserts in hybrid diapers aren't quite as bad as traditional disposables. These inserts are made with natural materials so they are able to decompose faster. This not apply if the inserts are thrown into a landfill where they will be buried under tons of other waste. If you are going to throw these diapers out you will be keeping human waster, plastic and other chemicals out of landfills, but to properly decompose these need exposure to sun and air. I like the fact that these inserts can be flushed. This in my opinion is a much better alternative to letting more waste end of in the landfills. And not only are you helping the impact on the environment, you are putting something more natural next to your baby's skin. If you are unsure if you want to wash cloth diapers, but you know you don't want to contribute to the landfills, then hybrid diapers may be for you. They are a very nice compromise between the two and not bad on your wallet either. Some moms find that they love using cloth diapers full time, but want to have disposable inserts on hand for nights or trips out of town. Either way, I think you can feel safe to use hybrid diapers without a serious impact on the environment.